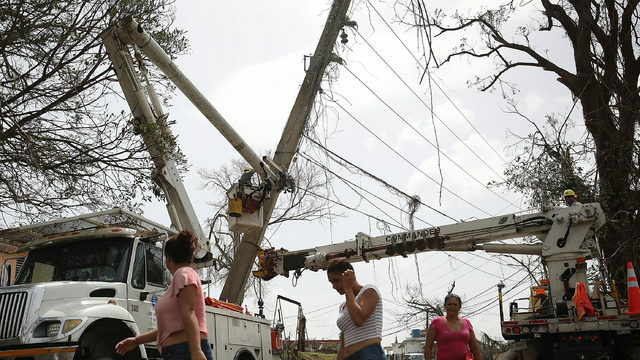 The power authority, also known as PREPA, opted to hire Whitefish rather than activate the “mutual aid” arrangements it has with other utilities. For many years, such agreements have helped U.S. utilities — including those in Florida and Texas recently — to recover quickly after natural disasters. The unusual decision to instead hire a tiny for-profit company is drawing scrutiny from Congress and comes amid concerns about bankrupt Puerto Rico’s spending as it seeks to provide relief to its 3.4 million residents, the great majority of whom remain without power a month after the storm. Whitefish Energy is based in Whitefish, Mont., the home town of Interior Secretary Ryan Zinke. Its chief executive, Andy Techmanski, and Zinke acknowledge knowing one another — but only, Zinke’s office said in an email, because Whitefish is a small town where “everybody knows everybody. As I write, the Whitefish Energy website is down. Whitefish Energy Holdings LLC, is based in Whitefish, Montana, servicing customers throughout the United States and now, proudly, Puerto Rico. WEH’s leadership and field management teams have proven track records and experience to execute on the most challenging projects. The Company’s extensive subcontractor relationships enable it to address projects at any scale while minimizing overhead and passing cost savings through to the client. Established in 2015, WEH is led by industry veteran Andy Techmanski who is a trained journeyman lineman with over 22 years of experience completing critical utility infrastructure projects worldwide. Techmanski is supported by a construction management team with decades of experience navigating mountainous terrain and difficult construction scenarios. Whitefish is backed by HBC Investments (HBC) and Flat Creek Capital (FCC), both based in Dallas, TX, and Comtrafo Transformers, based in Brazil. HBC is an investment firm that partners with strong management teams with proven track records, having successfully invested over $100mm in companies across various sectors. FCC is an investment fund focused on growth capital investments and has successfully invested in 12 portfolio companies since inception. Comtrafo produces distribution and power transformers, primarily focused on the energy and power industry. The Swamp draining continues. Ha! Definitely crony capitalism, but they are posting daily on their Twitter what they get hooked up. New gear may improve the Puerto Rican infrastructure. San Juan mayor picking a fight, PR bankrupted themselves and their politicians have the audacity to worry about cronyism.